Figure 14-6 The cardiac cycle. TVc, tricuspid valve closing; PVo, pulmonic valve opening; MVc, mitral valve closing; AVo, aortic valve opening; EC, ejection click; OS, opening snap; S1 to S4, first to fourth heart sounds. ejection click is heard at this time if the pulmonic valve is stenotic. When the pressure in the left ventricle exceeds the diastolic pressure in the aorta, the aortic valve opens. An aortic ejection click is heard at this time if the aortic valve is stenotic. 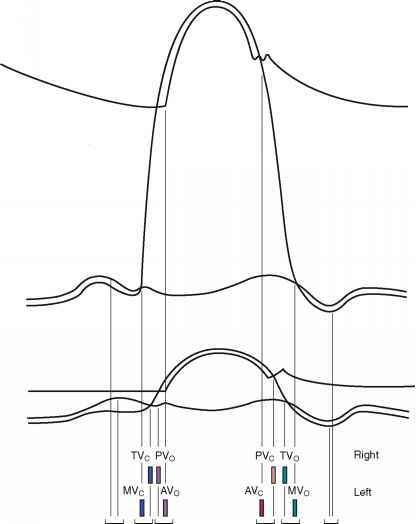 The time between the opening and the closing of the semilunar valves is the systolic period of ejection. The point at which ejection is completed and the aortic and left ventricular curves separate is called the incisura, or dicrotic notch, and is simultaneous with the aortic component of S2, or closure of the aortic valve;this is written A2. The pulmonic valve closes at the point when the right ventricular pressure falls below the pulmonary diastolic pressure. This is the pulmonic component of S2 and is commonly written P2. The time between the closure of the semilunar valves and the opening of the atrioventric-ular valves is called isovolumetric relaxation. The tricuspid valve opens when the pressure in the right atrium exceeds right ventricular pressure. A tricuspid opening snap may be heard if the tricuspid valve is stenotic. The mitral valve opens when the pressure in the left atrium exceeds left ventricular pressure. A mitral opening snap may occur at this time if the mitral valve is stenotic. With the opening of the atrioventricular valves, the period of rapid filling of the ventricles occurs. Approximately 80% of ventricular filling occurs at this point. At the end of the rapid filling period, a third heart sound (S3) may be heard. An S3 occurs 120 to 170 msec after S2. This period is approximately the same time as it takes to say ''me too.'' The "me" is the S2, and the ''too'' is the S3. An S3 is normal in children and young adults. When present in individuals older than 30 years, it signifies a volume overload to the ventricle. Regurgitant valvular lesions and congestive heart failure may be responsible. At the end of diastole, atrial contraction and the additional 20% of ventricular filling occur. A fourth heart sound (S4) may be heard. The interval from the S4 to the S1 is approximately the time it takes to say ''middle.'' The ''mid-'' is the S4, and the ''-dle'' is the S1. Note that the ''mid'' is much softer than the ''dle,'' which is quite similar to the S4-S1 cadence. An S4 is normal in children and young adults. 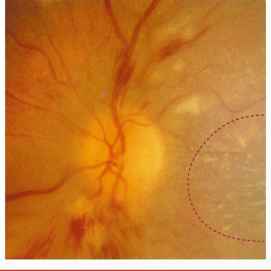 When present in individuals older than 30 years, it is indicative of a noncompliant, or ''stiff,'' ventricle. Pressure overload on a ventricle causes concentric hypertrophy, which produces a noncompliant ventricle. In addition, CHD is a major cause of a stiff ventricle. The presence of an S3 or an S4 creates a cadence resembling the gallop of a horse. These sounds are therefore called gallop sounds or rhythms. The first heart sound is loudest at the cardiac apex. Splitting of the first heart sound may be heard in the tricuspid area. The second heart sound is loudest at the base. The terms A2 and P2 indicate the aortic component and the pulmonic component of S2, respectively. A2 normally precedes P2, meaning that the aortic valve closes before the pulmonic valve. With inspiration, the intrathoracic pressure lowers. This causes more blood to be drawn from the superior and inferior venae cavae into the right chambers of the heart. The right ventricle enlarges, and it takes longer for all the blood to be ejected into the pulmonary artery; thus the pulmonic valve stays open longer. P2 occurs later in inspiration, and the split between A2 and P2 is widened during inspiration in comparison with expiration. This is the cause of physiologic splitting of S2, which is diagrammed in Figure 14-7. The blood in the right ventricle is then pumped into the large-capacitance bed of the lungs. Therefore, the return of blood from the lungs to the left side of the heart is decreased, and the left atrium and left ventricle become smaller. Atrial receptors trigger a reflex tachycardia that compensates for the decreased left ventricular volume. This increase in heart rate with inspiration is termed sinus arrhythmia. It is a misnomer because it is not really an arrhythmia but a normal physiologic response to a decreased left ventricular volume during inspiration. This is an audio all about guiding you to relaxation. 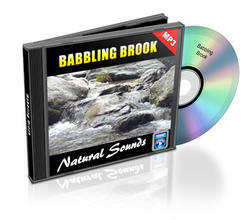 This is a Relaxation Audio Sounds with sounds from the Babbling Brooks.